It’s that special time of year again for ecommerce businesses. The final quarter where customers seem to be more willing to spend than any other period. In 2015, the holiday months of November and December generated an average of 30% more retail revenue than non-holiday months. And the 2016 holiday period saw total retail sales rise by almost 4% to $658.3 billion in the US alone. But it’s much more than just Black Friday and Christmas marketing. The whole of Q4 is jam packed full of numerous key dates in the 2017 retail calendar. Dates that any ecommerce business can take advantage of to maximise their sales. Let’s take a deeper look at each of these key dates in the final quarter of your 2017 retail calendar and how they can help increase your sales. Canadian Thanksgiving takes place more than a month earlier than the more well-known US equivalent. On the second Monday every October, in fact. The holiday doesn’t spark the retail furore its counterpart does south of the border. But there’s definitely some holiday shopping excitement caused in October. It therefore makes sense to consider some kind of promotion or campaign if you serve any kind of Canadian market. Even if you don’t, running a ‘novelty campaign’ to celebrate Canadian Thanksgiving could help drive a few more sales. The premise of Buy British Day is just as it sounds – to encourage people to spend on British made items. This is a key date for any UK online retailers or those who sell British products as it’s a great opportunity to increase revenues. Some recent research by Barclays Bank indicated that products labelled ‘Made in Britain’ command a considerably higher premium when sold abroad than those with no declared country of origin. Highlighting your support for Buy British Day across social media is a great way to hop on board. You could maybe even tell stories behind the British manufacture of certain products. Spending tends to rise during half term as parents search for ways to keep their kids looked after and entertained for the week. Research from Equifax indicates that parents nationwide spend on average £60 a day extra on their children during the half term period. While some of this will go out to childcare and local entertainment, it’s still an opportunity for online retailers to increase sales. If you offer any items that could potentially distract the kids then this is the time to push them hard to parents. Most English schools break up Friday, 20th October. However, the dates differ in various regions. Check dates for specific regions here. According to RetailWeek, UK Halloween spending was expected to hit £472 million in 2016. It’s an even more inflated story in the US as they look set to top $9.1 billion this year. Food, clothing, decorations and entertainment are the biggest contributors to these spending figures. Sellers of anything within these four categories should therefore take note and ramp up marketing efforts. But it’s also worth noting that the clocks going back around this period tends to increase our internet spending habits in general. In fact, the longer evenings see us spend an extra 42 minutes a week shopping online at night. It’s estimated that less than a third of British adults take part in a Bonfire Night activity. But those who do still spend a total of around £386 million. This makes it a major date for any retailers. If you’re a UK retailer selling anything that can be tied into Bonfire Night celebrations then it’s well worth taking advantage of. Bonfire night is obviously huge for fireworks retailer, Epic Fireworks. They do a great job in the run up to the night and share lots of content and blogs on fireworks and how to stay safe while using them. Chinese Singles Day is the biggest shopping day in the world. That’s right – bigger than Black Friday, Cyber Monday and Christmas. In 2016, Chinese shoppers reportedly spent a monumental £14.2 billion over the 24 hour period. The event began in the 1990s when single Chinese students began buying themselves gifts to celebrate their independence. But it quickly turned into a retail frenzy when ecommerce giant Alibaba began promoting it in 2009. With a hot Chinese appetite for British goods, many UK companies have already been taking advantage of the day in recent years. This makes Singles Day a not to be missed opportunity for any online retailers who export to or have the ability to sell in China. Grey Thursday is the day before Black Friday. In other words, it’s where retail stores have started opening on Thanksgiving Day as a warm up to their Holiday Weekend sales. Online retailers are obviously ‘open’ all the time. But it’s worth setting up a Grey Thursday campaign of some form in order to begin enticing customers into your sales. If you sell in the US then this can be particularly fruitful as many people will head to online shopping after the traditional family dinner. It goes without saying that Black Friday is a gigantic date in the retail calendar. Ecommerce sales in 2016 broke US records with $3.34 billion being spent online, a 17.7% increase on the previous year. But with UK Black Friday sales also hitting £1.23 billion last year, this truly is a huge event on both sides of the Atlantic. It’s a great idea to have blog content up on your various deals or plans for Black Friday at least a week before. Keeping in contact with your email list and having countdowns on social media is also useful. However, being prepared well in advance with specific Black Friday marketing ideas and strategies is key to ensuring you take full advantage. Cyber Monday is much more than a tag along to Black Friday. In fact, Cyber Monday 2016 was the biggest day in US ecommerce history with online sales hitting $3.45 billion. 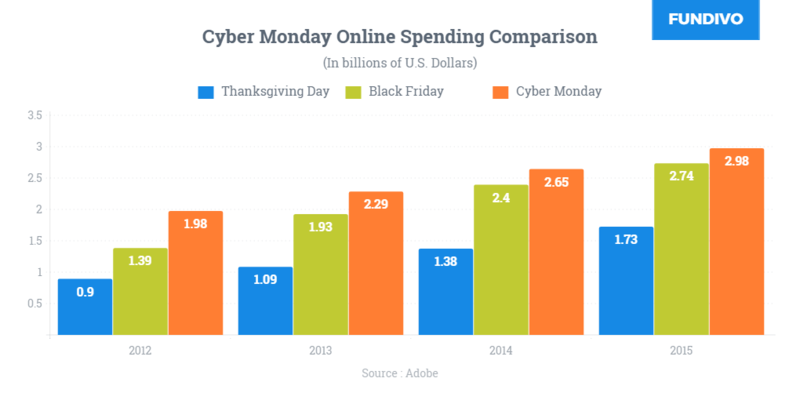 Fundivo also report that Cyber Monday has performed consistently better than Black Friday in ecommerce over recent years. It’s fine using similar marketing ideas to ones used for Black Friday. But it’s imperative to have separate campaigns set up specific to Cyber Monday in order to take full advantage. With £717 million being spent on this day in 2016, it’s fair to say this is a huge opportunity for small businesses. The premise is to encourage consumers to shop at local or smaller businesses, rather than huge corporations. Green Monday was coined by eBay to describe their best sales day before Cyber Monday took over. Taking place the second Monday of every December, comScore claimed $1.6 billion of online desktop sales came on Green Monday day in 2016. This puts it right up there with other huge Q4 dates, so being prepared is key. Ensure you have special discounts planned and that you effectively communicate these across your email list and social channels. With 2015 sales hitting $1.48 billion, Free Shipping Day 2017 is an excellent opportunity for online retailers. Make sure you take full advantage by encouraging the purchase of as many items per order as possible. Introducing special discounts or product bundles is an excellent way to take advantage. Of course, the exact dates differ depending on where you’re shipping to and what service is being used. But it is well worth keeping these in mind for your retail calendar as they can be very powerful in creating a sense of urgency with potential customers. Try having a countdown on your website or ‘Save the Date’ button in the final few days leading up to the exact last moment you can take orders for Christmas delivery. The final Q4 dates worth mentioning are Christmas Day and Boxing Day. Retail Gazette reports that UK online sales on these two days in 2016 were expected to reach £1.8 billion combined. It seems these two days are where many people get bored of family time and reach for their shiny new devices to do some online retail therapy. This is the perfect opportunity for ecommerce brands to strike with an email campaign to promote any offers you have. Don’t forget to include any specific deals or offer codes in the subject line to help increase open rates. There you have it – a complete list of important Q4 dates in the 2017 retail calendar. Remember to plan ahead for these as far ahead as possible in order to maximise your sales. Did we miss any out? Let us know in the comments below if there are any other big 2017 retail calendar dates that you put promotions on for. Enjoyed reading this? Download our calendar packed with the essential dates for Q4.